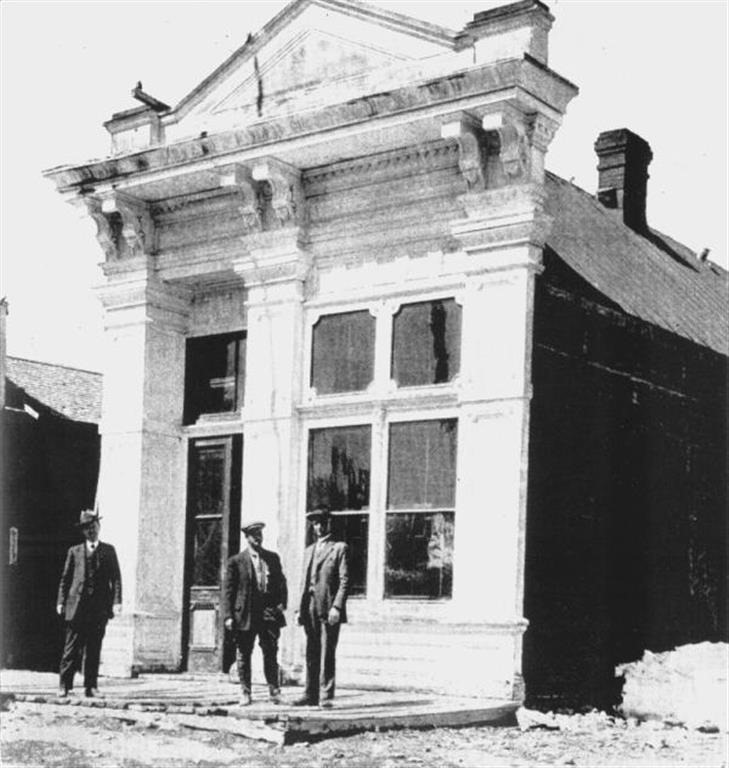 J. S. Cain bought The Bodie Bank in 1890 from E. L. Benedict after making quite a large fortune from a block of ground in the Standard Mine. From then on, Cain would be investing and building in the town quite a bit. 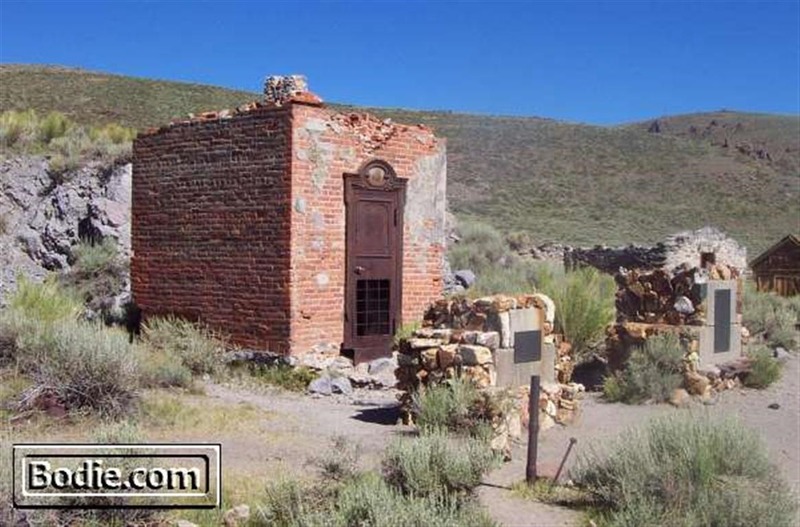 Because Cain owned the bank and had so many businesses dealings with so many people in and around Bodie, it’s likely that people were in and out of here all day long. Not much remains today. 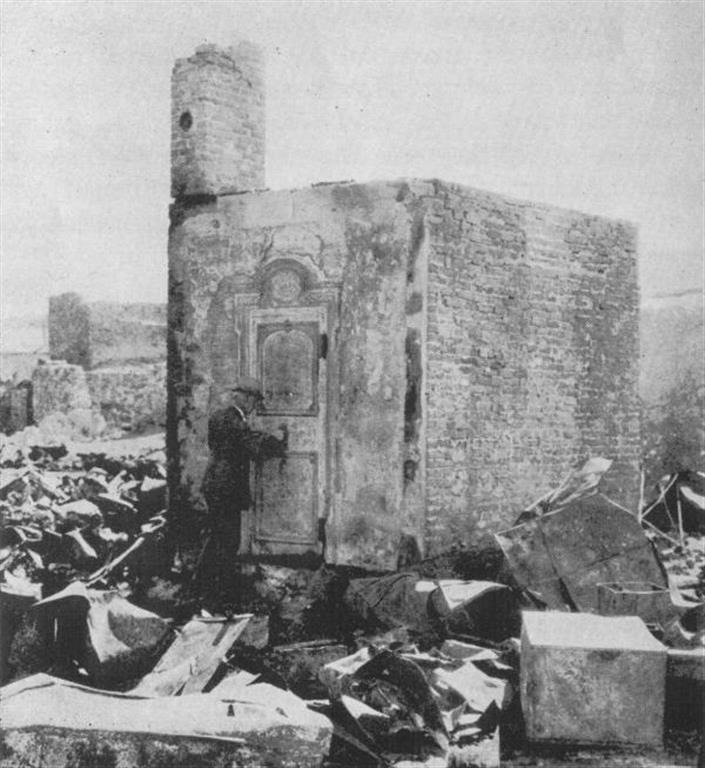 The photo to the lower-left was taken shortly after the 1932 fire that destroyed most of the town. The bank had gone untouched by the 1892 fire, but wasn’t as lucky this time. During the fire, Cain was optimistic that the building would again escape destruction, but unfortunately he was wrong. At one point, as the fire spread to the roof of the bank, a few of the men rushed into the burning building, and tried to remove the beautiful walnut counter. They apparently got it to the door, but ended up jamming it in place, so as to block the exit completely – stopping the removal of the counter and any other items that could have been saved. 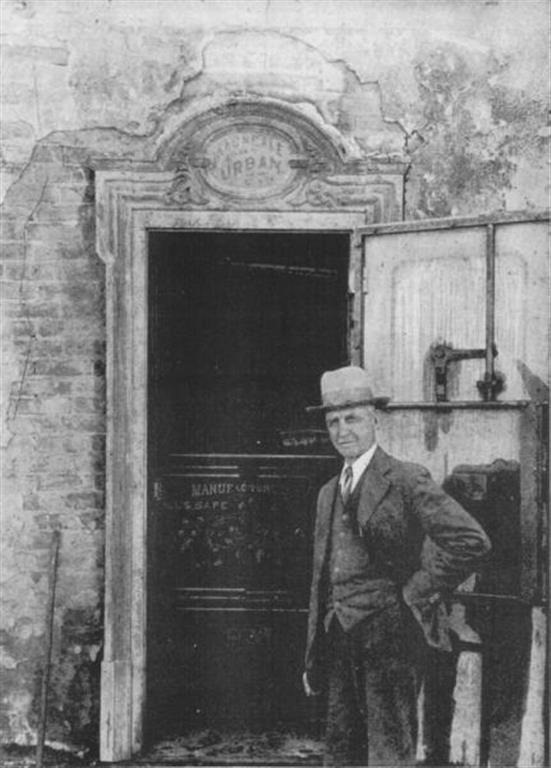 In the picture to the right, Cain is seen posing with the safe that is still inside the remains of the vault. According to stories, none of the valuables INSIDE the safe were damaged when the fire leveled the rest of the bank. Before the fire actually got to the bank though, Cain’s grand-daughters, Helen and Ruth, got the key to the bank from their grandfather, so they could save some of their favorite items. Cain was sure the bank would be fine, but let them get their things to make them feel better. As we know, and Cain found out very soon that day, the bank was completely destroyed, except for the brick shell of the vault, and the contents of the safe. If you visit Bodie, you can still see the beautifully decorated safe through a hole cut in the large metal door.